In the Times of Malta article about General Gerasimov’s appointment as Chief of Staff, Putin appoints a new army chief, Putin is quoted as saying, “new means of conducting warfare are appearing.” It would seem that Putin’s choice to head Russia’s military has taken it upon himself to formulate and refine these new means of conducting warfare, which may prove to be ideal for implementing the Putin Doctrine. The Georgii Isserson mentioned in the above quote in the FT was a theoretician of “deep battle” (about which I wrote in Deep Battle and the Culture of War) and the author of two important treatises, The Evolution of Operational Art, 1932 and 1937, and Fundamentals of the Deep Operation, 1933. (The former has been translated into English and is available in PDF format.) Thus we see that Gerasimov is drawing on an established tradition of Russian strategic and tactical thought, and we might well ask, in an inquiry regarding hybrid warfare, if the latter constitutes the contemporary extrapolation of the Soviet conception of deep battle. Isserson’s The Evolution of Operational Art is a highly ideological book, at the same time as being both a theoretical and practical military manual. Throughout the text he employs the language and the concepts of Marx, Engels, and Lenin in a way that is familiar from many Soviet-era books. While some Soviet-era texts following this pattern are a worthless Hodge-podge, fawning for Party approval, in the case of Isserson’s book, the intermingling of revolutionary communism and organized, large-scale military violence works quite well, and this is one of our first clues to understanding the nature of hybrid warfare. There is a continuum that extends from revolutionary violence to military violence, and it is not necessary to limit oneself to any one point on this continuum if one has the ability to act across the spectrum of operations. If the methods of warfare described by General Gerasimov are to be understood as the definitive statement — so far — of hybrid warfare, then we can see from his article that this is a highly comprehensive conception, but not merely eclectic. The general states that, “Frontal engagements of large formations of forces at the strategic and operational level are gradually becoming a thing of the past.” This is undoubtedly true. I have observed many times that there have been no peer-to-peer conflicts since the middle of the twentieth century, and none seem likely in the near future. So while hybrid warfare is a comprehensive conception, it is not about peer-to-peer conflict or frontal engagements of large formations. Hybrid warfare is, in a sense, about everything other than peer-to-peer frontal engagement. One might think of this as the culmination of the mobile small unit tactics predicted by Liddel-Hart and Heinz Guderian, practiced by the Germans with Blitzkrieg, and further refined throughout the latter half of the twentieth century, but I don’t want to too quickly or readily assimilate Gerasimov’s conception to these models of western military thought. Science and its applications lies at the root on industrial-technological warfare no less than at the root of industrial-technological civilization, both of which are locked in a co-evolutionary spiral. Not only does the scope of civilization correspond to the scope science, but the scope of war also corresponds to the scope of science. And not only the scope of science, but also its sophistication. If Gerasimov can imbue this spirit into the Russian general staff, he will make a permanent contribution to Russia military posture, and it is likely that the Chinese and other authoritarian states that look to Russia will learn the lesson as well. That the idea of hybrid warfare has been given a definitive formulation by a Russian general, drawing upon Soviet strategy and tactics derived from revolutionary movements and partisan warfare, and that the Russian military has apparently implemented a paradigmatic hybrid war in east Ukraine, is significant. Even as a superpower, the Russians could not compete with US technology or US production; Soviet counter-measures were usually asymmetrical — and much cheaper than the high-technology weapons systems fielded by the US and NATO. Even as the US built a carrier fleet capable of dominating all the world’s oceans, the Soviets built supersonic missiles and supercavitating torpedoes that could neutralize a carrier at a fraction of the cost of a carrier. This principle of state-sponsored asymmetrical response to state-level threats is now, in hybrid warfare, extended across the range of materiel and operations. How can hybrid warfare be defined? How does hybrid warfare differ from MOOTW? How does hybrid warfare differ from asymmetrical warfare? How does hybrid warfare differ from any competently executed grand strategy? Any definition of war is going to incorporate presuppositions, but in asking radical questions about warfare we want to question our own presuppositions about war. This suggests the possibility of the via negativa. What is the opposite of war? Not peace, but non-war. What is non-war? That is a more difficult question to answer. Or, rather, it is a question that takes much longer to answer, because non-war is anything that is not war, so in so far as war is a limited conception, non-war is what set theorists call the complement of war: everything that a (narrow) definition of war says that war is not. Each definition of war implies the possibility of its own negation, so that there are at least as many definitions of non-war as of war itself. Clausewitz wrote in one place that, “war is the continuation of politics by other means,” while in another place he wrote that war is, “an act of violence intended to compel our opponent to fulfill our will.” Each of these definitions of war can be negated to produce a definition of non-war, and each produces a distinct definition of non-war. The plurality of conceptions of war and non-war point to the polysemous character of hybrid warfare, which exists on the cusp of war and non-war. ● Acoustic Warfare (DOD, NATO) Action involving the use of underwater acoustic energy to determine, exploit, reduce, or prevent hostile use of the underwater acoustic spectrum and actions which retain friendly use of the underwater acoustic spectrum. ● Antisubmarine Warfare Operations conducted with the intention of denying the enemy the effective use of submarines. ● Biological Warfare (DOD, NATO) Employment of biological agents to produce casualties in personnel or animals, or damage to plants or materiel; or defense against such employment. ● Chemical Warfare (DOD) All aspects of military operations involving the employment of lethal and incapacitating munitions/agents and the warning and protective measures associated with such offensive operations. Since riot control agents and herbicides are not considered to be chemical warfare agents, those two items will be referred to separately or under the broader term “chemical,” which will be used to include all types of chemical munitions/agents collectively. ● Directed-Energy Warfare (DOD) Military action involving the use of directed-energy weapons, devices, and countermeasures to either cause direct damage or destruction of enemy equipment, facilities, and personnel, or to determine, exploit, reduce, or prevent hostile use of the electromagnetic spectrum through damage, destruction, and disruption. It also includes actions taken to protect friendly equipment, facilities, and personnel and retain friendly use of the electromagnetic spectrum. ● Electronic Warfare (DOD) Military action involving the use of electromagnetic and directed energy to control the electromagnetic spectrum or to attack the enemy. Electronic warfare consists of three divisions: electronic attack, electronic protection, and electronic warfare support. ● Guerrilla Warfare (DOD, NATO) Military and paramilitary operations conducted in enemy-held or hostile territory by irregular, predominantly indigenous forces (also called Partisan Warfare). ● Irregular Warfare (DOD) A violent struggle among state and non-state actors for legitimacy and influence over the relevant population(s). Irregular warfare favors indirect and asymmetric approaches, though it may employ the full range of military and other capacities, in order to erode an adversary’s power, influence, and will. ● Multinational Warfare (DOD) Warfare conducted by forces of two or more nations, usually undertaken within the structure of a coalition or alliance. ● Naval Coastal Warfare (DOD) Coastal sea control, harbor defense, and port security, executed both in coastal areas outside the United States in support of national policy and in the United States as part of this Nation’s defense. ● Naval Expeditionary Warfare (DOD) Military operations mounted from the sea, usually on short notice, consisting of forward deployed, or rapidly deployable, self-sustaining naval forces tailored to achieve a clearly stated objective. ● Naval Special Warfare (DOD) A designated naval warfare specialty that conducts operations in the coastal, riverine, and maritime environments. Naval special warfare emphasizes small, flexible, mobile units operating under, on, and from the sea. These operations are characterized by stealth, speed, and precise, violent application of force. ● Nuclear Warfare (DOD, NATO) Warfare involving the employment of nuclear weapons (also called Atomic Warfare). ● Surface Warfare (DOD) That portion of maritime warfare in which operations are conducted to destroy or neutralize enemy naval surface forces and merchant vessels. ● Unconventional Warfare (DOD) A broad spectrum of military and paramilitary operations, normally of long duration, predominantly conducted through, with, or by indigenous or surrogate forces who are organized, trained, equipped, supported, and directed in varying degrees by an external source. It includes, but is not limited to, guerrilla warfare, subversion, sabotage, intelligence activities, and unconventional assisted recovery. ● Under Sea Warfare (DOD) Operations conducted to establish and maintain control of the underwater environment by denying an opposing force the effective use of underwater systems and weapons. It includes offensive and defensive submarine, antisubmarine, and mine warfare operations. One of the ways in which we might understand hybrid warfare is as accepting prima facie this diverse admixture of types of warfare that, in Wittgensteinian terms, overlap and intersect. Hybrid warfare, then, may consist of selectively, and at times simultaneously, pursuing (or avoiding) any and all possible forms of warfare across the spectrum of conflict. Given the comprehensive scope of hybrid warfare, the resources of a major industrialized nation-state would be a necessary condition for waging hybrid warfare, and this clearly distinguishes hybrid warfare from irregular, partisan, or unconventional warfare in the narrow sense. Only the most successful and well-funded non-state entities could aspire to the range of operations implied by hybrid warfare, and in so far as one of the essential feature of hybrid warfare is the coordinated use of regular and irregular forces, a non-state entity without regular forces would not, by definition, be in a position of wage hybrid warfare. But it would be a mistake, as we can see, to get too caught up in definitions. As we can see, trying to answer the question, “What is hybrid warfare?” (much less, “What is war?”) raises a host of questions that could only be dealt with adequately by a treatise of Clausewitzean length. Perhaps the next great work on the philosophy of war will come out of this milieu of hybrid conflict. S-300 SAM on the back of a mobile launch platform. 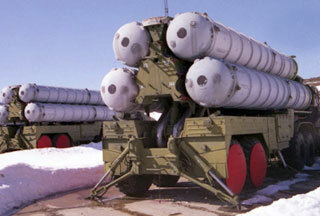 The S-300 SAM tilted up and ready to fire, with the radar array also visible on its own mobile platform. 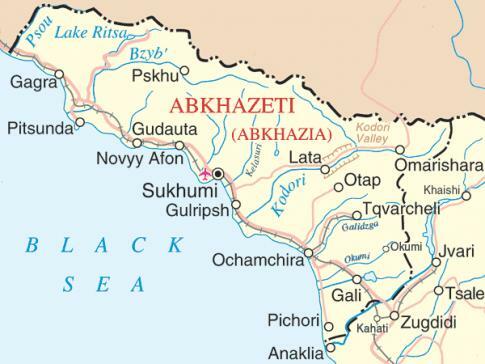 Abkhazia is legally a part of Georgia but it able to assert its independence because Russia is more than happy to have a stick to poke in Georgia's eye. It is now apparent that the S-300 has been in Abkhazia for some time, and has only now been revealed publicly, on the two year anniversary of the war between Russia and Georgia over South Ossetia. At the same time that Russia won this war, it also recognized the independence of Abkhazia (also recognized by Nicaragua, Venezuela, Nauru, South Ossetia, and Transnistria) which is legally and formally still a part of Georgia, but Georgia is not in a position to militarily enforce its rule in either Abkhazia or South Ossetia, not least because Russia is unhappy about Georgia pursuing links with the West and wants to punish Georgia for this. One way to punish Georgia, besides simply defeating them in a very one-sided war, is to provide aid and comfort to Abkhazia and South Ossetia. The flag of the Republic of Abkhazia, indulged in its desire for independence from Georgia by Russian miliary power. Given the way that the US media treats events — a region is invisible until some event occurs, and then there is a sudden shift from invisibility to saturation coverage based entirely on the most superficial elements of the crisis that propelled the region into the news — all historical context was lost, and I recall there being a great deal of confusion over exactly what was going on and why. To put it bluntly, most people didn’t know which side they should be rooting for, as the end of the Cold War marked the end of simplistic us-against-them foreign policy as dozens of “new” nation-states emerged from the wreckage of the Soviet Union and it was not clear who stood for what in this welter of nationalisms. Even recent history, the series of events leading up to the 2008 war, was poorly reported if at all. But it’s really not that difficult to grasp. Russia wanted to, and still wants to, assert its authority within its “sphere of interest,” and since Georgia is in Russia’s “near abroad” it falls decisively within what Russia believes should be its sphere of interest. But Georgia didn’t play by Russia’s rules (unlike other very small countries in the Caucasus such as Armenia). Georgia made nice with the US and Western Europe, and even asked about joining NATO. This was too much for the Russians. The Russians knew that the South Ossetians and the Abkhazians did not want to be part of Georgia, so the Russians supplied them with arms and expertise, and prior to the 2008 war a series of border provocations by the South Ossetians (though almost certainly instigated by the Russians) baited Mikheil Saakashvili into a war he could not win. This much is obvious. 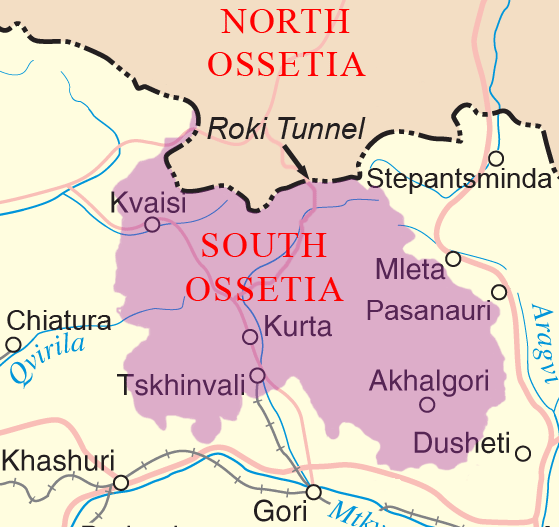 What is not obvious is why Saakashvili allowed himself to be so baited, and, allowing himself to be baited, why the first objective of the Georgian military was not securing the Roki tunnel, which is the only road passage between North Ossetia and South Ossetia in this area. The proactive measure would have been to secure (or close) the Roki tunnel before any military adventures were undertaken. We will not consider this further at present. Both civilization and war arise from and require in turn extensive social organization, that is the say, the implementation of intelligence in the organization of human activity as well as the creation of special institutions devoted to particular purposes. This makes them social technologies. Moreover, two social technologies in coevolution are two sets of practical implementations of intelligence with their histories intertwined. The coevolution of civilization and war together constitute human history. One practical consequence of this observation is that civilizations will make war based upon the assumptions, presuppositions, meanings, values, and purposes of that civilization. In other words, war is a cultural expression. We find this most obviously exemplified in highly isolated civilizations and the forms of ritualized (if not stylized) violence that they have perfected when spared the immediate pressure of an external enemy (I am thinking, inter alia, of the Aztec “Flower Battle”, Samurai swordsmanship, and the Mandan Sundance). However, even in cases in which an external enemy demands a strictly utilitarian approach to warfighting, a given civilization’s way of making war is still profoundly specific to its culture. Russian civilization (what Samuel Huntington called Orthodox Civilization) has been in coevolution with the warfare that has defined its history, just as the same has happened in Western Europe and the same has happened in North America. But in each case the history in question is different because it supervenes upon different geographical facts, and the geographical facts not only govern things like where you can build a road, where you must have a bridge (or a tunnel), or how quickly an army can pass through a given territory, but also more subtle manifestations of culture that emerge from the way that a given people make a life for themselves within a given landscape. For the Russian people, the overwhelming fact of their land is the vast Central Asian Steppe. There are few natural borders or natural obstacles, and virtually no obstacles to the passage of an army. In much of Russia, you don’t even need a road. A tank can just as well pass over the rolling farmland as drive down the road. The road would be a little quicker, but not all that much quicker. This vast space is Russia’s weakness, the Russian Achilles’ heel, but it is also a source of strength and of defense. The more space you can put between yourself and your enemies, the more you can wear them down before they get to you. The vast spaces of Russia are a buffer zone, and it is a buffer zone that the Russians have always sought to increase. When the Germans staggered Stalin by invading despite the Molotov-Ribbentrop Pact, the Russians retreated into their vast interior, leaving scorched earth behind them and rebuilding their entire war industry in the east. Some who lived through this said that it was as though the entire land lifted up, tilting inland, and everything rolled to the east. It was the sheer vastness of the Russian Steppe that made this possible. But it is also a vast territory to defend, and it is extraordinarily difficult to defend. Space is the Russian’s friend and the Russian’s enemy. 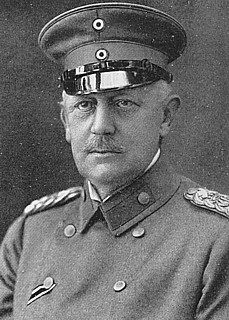 Alfred von Schlieffen spent his military career preparing for a great war, and his last words are said to have been, “Keep the right strong.” But he died a year before the outbreak of the First World War, and von Moltke weakened the right and lost the war. In the West, where the development of industrialized civilization has moved very rapidly, where we have accepted that change is the only constant in life, and we say that “time is money” because we value both, it is time that is the West’s friend and time that is the West’s enemy. The Germans, however German they are, are also Westerners, and they understand this about time. The whole Schlieffen Plan for the war that became the First World War was predicated on precise timing. France was to be defeated by going through Belgium, taking Paris, and obtaining the French surrender in time to put the troops on trains to the eastern front in time to meet and defeat the vast but presumably slow-moving “Russian Steamroller.” The problem with plans based upon precise timing is that when the timing goes awry the whole battle plan also goes awry, which can lead to the loss of a war (as it did with the Germans). The continuous development of small unit tactics that began with German Blitzkrieg and which culminate in today’s Western military doctrine has also continued its emphasis upon the strategic mastery of time. Early formulations of Blitzkrieg emphasized the speed of the assault. Contemporary formulations in terms of the “Boyd cycle” (so named for USAF Colonel John Boyd, who developed the doctrine), which postulates a decision loop of observation, orientation, decision and action, focus upon completing the cycle as quickly as possible. Boyd is quoted as having said, “In order to win, we should operate at a faster tempo or rhythm than our adversaries.” This is wonderful idea, and it can be developed with great depth and richness, but when one is fighting against a guerrilla force whose entire strategy is about waiting and patience, because they know that a democratic political system cannot sustain combat operations over the long term, and they can sustain combat operations over the long term, the idea reveals certain limitations. Flow chart of the OODA loop developed by John Boyd: a cycle of observation, orientation, decision, and action. Enforcing Soviet military control over central and eastern Europe was one way for Russia to provide itself with a larger spatial buffer zone — indeed, a buffer zone that was not part of Russia proper and therefore, in a sense, expendable — but this was only one feature of the Russian strategic control of space among many. Another feature that became familiar to those who studied U-2 spyplane photographs, and later satellite imagery during the Cold War, was the Russian propensity for spatial depth in security. Photograph analysts knew that they had found a high value site when they found concentric rings of fencing around a site. For its highest security installations, the Russians would build concentric rings of fences, sometimes six or more deep, in their quest for the control of space. Another obvious form of the strategic control of space is the idea of defense in depth. The US DOD defines defense in depth in this way: “The siting of mutually supporting defense positions designed to absorb and progressively weaken attack, prevent initial observations of the whole position by the enemy, and to allow the commander to maneuver his reserve.” Every military the world over is familiar with defense in depth, and during the First World War, when the defense was preeminent, there were rows upon rows of trenches so that if the first trench did not stop an enemy advance the next would, and so on. The Russians have gone much farther with the concept of defense in depth and during the Soviet period developed a body of doctrine known as Deep Battle. This deserves our attention both because it highlights the Russian philosophy of war and also because it is one of the few genuinely distinctive military philosophies that does not fall under the family of what we may generally call Blitzkrieg doctrines. Blitzkrieg is much more than the German advance over Poland and France during the Second World War; it has, since that time, developed into a comprehensive body of military doctrine that is the basis of military tactics all over the world. I have written about this on several occasions (for example in The Dialectic of Stalemate and The Power of Mobile Fire). It is also my personal view that the apotheosis of Bliztkreig will be found in the developing idea of swarm warfare — the ne plus ultra of mobile fire — but more on that later. Deep battle is something very different from Blitzkrieg. If Blitzkrieg is something like getting a head start and running right over the top of your enemy before he knows what hit him, then deep battle is something like seizing your enemy by the throat, holding him as far away from you as you can, and pummeling him until he surrenders. If Blitzkrieg aspires to be an unstoppable force, deep battle aspires to be an immovable object, and it was always been one of those pseudo-philosophical nonsense questions as to what happens when an unstoppable force meets an immovable object (sort of like, “How high is up?”). Deep battle is obviously an idea that emerges primarily from operations on land — and, if we may also say, operations on the vast Russian Steppe. I have no doubt that Russian theorists have developed deep battle doctrines for air and sea forces, and it is not difficult to imagine their broad outlines, but this is secondary to the land-based operations that would or could secure the borders of Russia. Indeed, since deep battle emphasizes combined arms operations to a greater degree than the Blitzkrieg family of military doctrine, one might suggest that in absorbing air and naval operations as part of combined arms operations that they have been made auxiliary to land forces. Compare this to the centrality of maintaining air superiority as it figures in US and NATO operations. And this brings us back to Abkhazia. The Russians have S-300 missile batteries in Abkhazia. They also have them right across the border in Russia, and they have them in Armenia, and probably elsewhere as well. In the Caucasus, the Russians could pretty much count on control of the air. There are few places that they could not reach in the region. 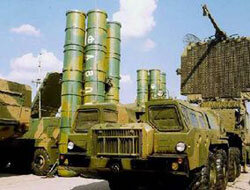 The S-300 later variants have a 200 mile radius. The S-400 missiles have a longer range, though these assets are all within Russian territory proper (I don’t think they’ve sold the system yet, but I could be wrong on this). This is not the kind of situation into which the US or NATO would want to insert itself. In its recent engagements, the US and NATO have possessed overwhelming air superiority, and they have used it. Russia has denied the possibility of unchallenged air superiority in its near abroad, and in doing so has extended its security buffer zone and given itself a little more depth.